Angela and Gary’s Story – "I KNOW TORONTO!" We wanted to stay in the city centre, in an area with an “annex feel” which is where we’ve been for ages, but with more of a family/community atmosphere. We were looking in the Brown school area, since this is where we plan to send our children for their primary years and French immersion. What we found with the Rathnelly pocket of South Hill was a wonderful little enclave of young families, with a definite community spirit and sense of fun! The fun history of the area that lives on and the people who live make the neighbourhood unique. (There’s a martini glass in the new street signs which gives you an indication.) What we found was kids central really, just north of Dupont/west of Avenue, still Annex in feel, and very much a front porch, friendly, thriving community in the South Hill republic of Fathnelly pocket. We were looking for a detached home that was already renovated for the most part (with two small babies, we were not looking to do a major reno.) Community was very important with lots of young families, and friends for our small children. 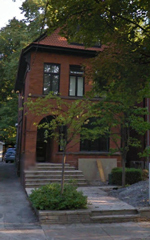 It needed to be in the Brown district for French immersion schooling. The house also needed to be beautiful, and preferably a Victorian. We also wanted a home that was a short walk to the café district along Yonge/Yorkville/Avenue Road and we wanted it to be surrounded by parks. We actually came in below budget, which was helpful as we were able to personalize the house with finishing touches afterwards. We had been looking at quite a large range in the South Hill area and assumed we had to come in at the top end, but when we found this house, things aligned very well within comfortable budget. We noticed that the top of South Hill hasn’t turned over yet, and doesn’t have the same community vibe as the Rathnelly area. After almost three years of consideration at our end, before having met Shawn , we realized that we wanted to be in the Brown school district and in the South Hill area. We were looking for a precise street actually in South Hill’s Republic of Rathnelly area. When we met Shawn, he knew this was the hub we were focusing in on. He kept his ear to the ground and in pretty quick time found an exclusive sale option for us on our favourite street, which allowed us to buy the house before it hit the market. It was a bidding war, regardless. The incredible thing is that when Shawn told us there was a detached house for sale on our street, before we knew the address, my husband drove down the street that eve and came back saying there was only one he particularly liked. (there are only four detached homes on the street, so highly coveted) When we found out the address the next day, it turned out to be the one. We found ourselves buying the house all in one evening, and just so happened that I also gave birth to our second baby the next week! What we noticed with Shawn is that he listened, quickly understood what we were looking for, and kept us front of mind in the search. It took us only a couple of months once we found Shawn to buy the home we were looking for. He also had great advice for us along the way, and throughout the purchasing negotiations. This was our first house, so having someone to trust throughout the process was a great advantage.